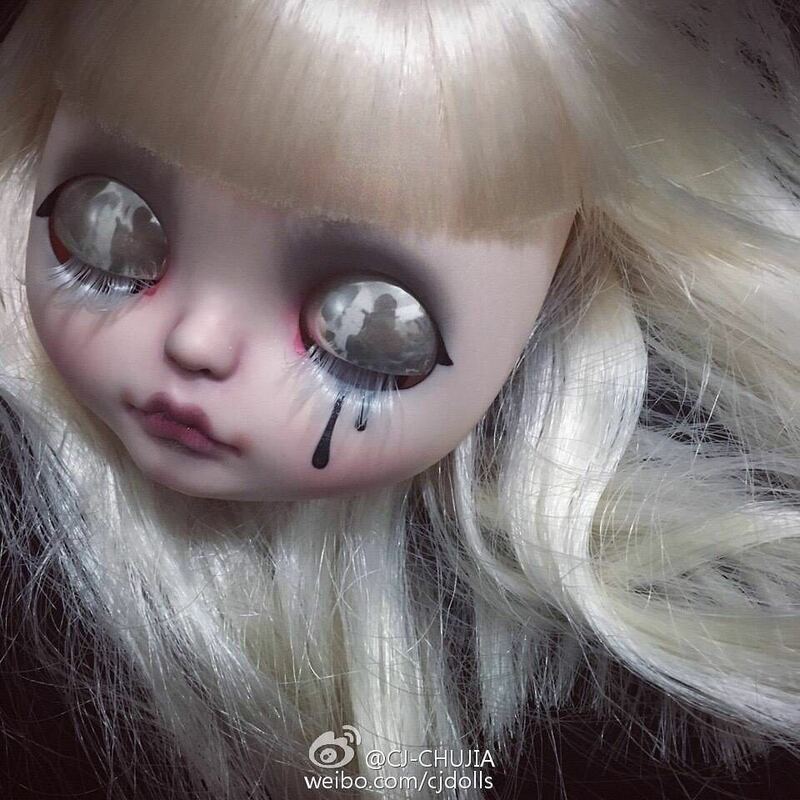 Chujia Yin is an amazing artist, and her artistic gifts translate amazingly into her customized Blythe dolls. 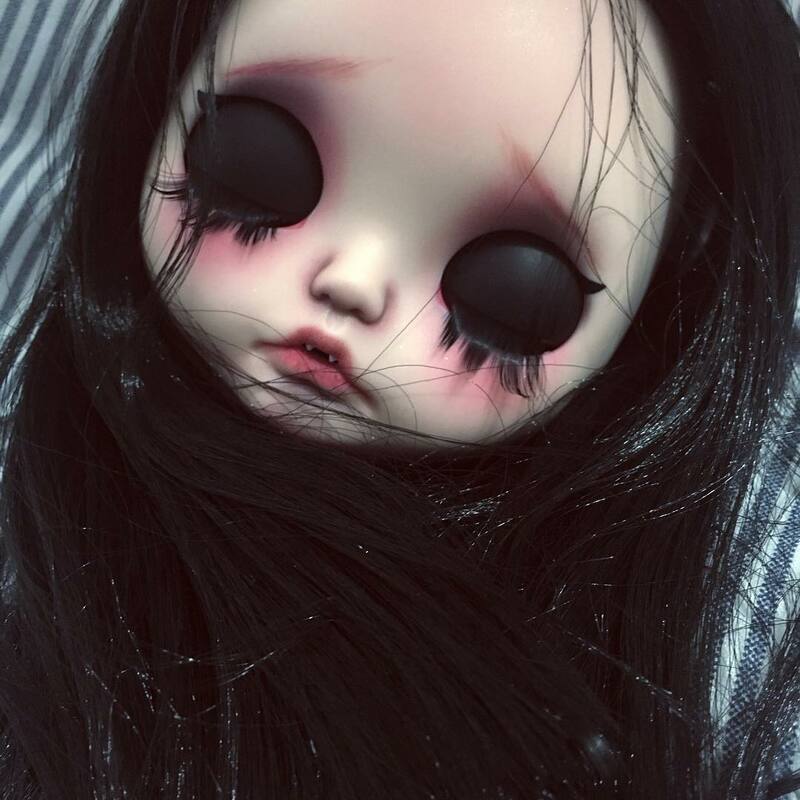 She brings bittersweet darkness into the doll game. 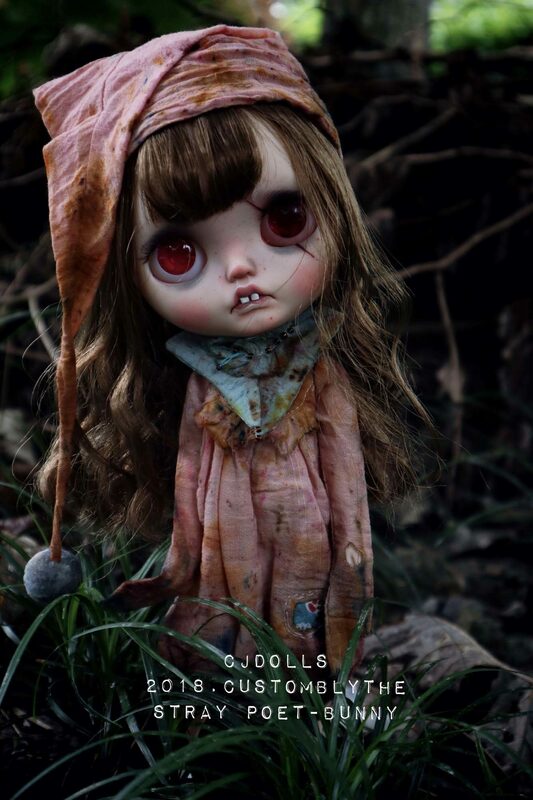 Some of her dolls are quite dark, with scars and wounds, but wonderfully sweet. My style comes from some of my strange dreamworlds, daydreams or some experiences, poems, movies, and music. I was born into an artistic family, and I feel so lucky to be brought up in Art. I studied Architecture and Environmental Art as an undergraduate, and then got a master’s degree in Exhibition Design from China Academy of Art. 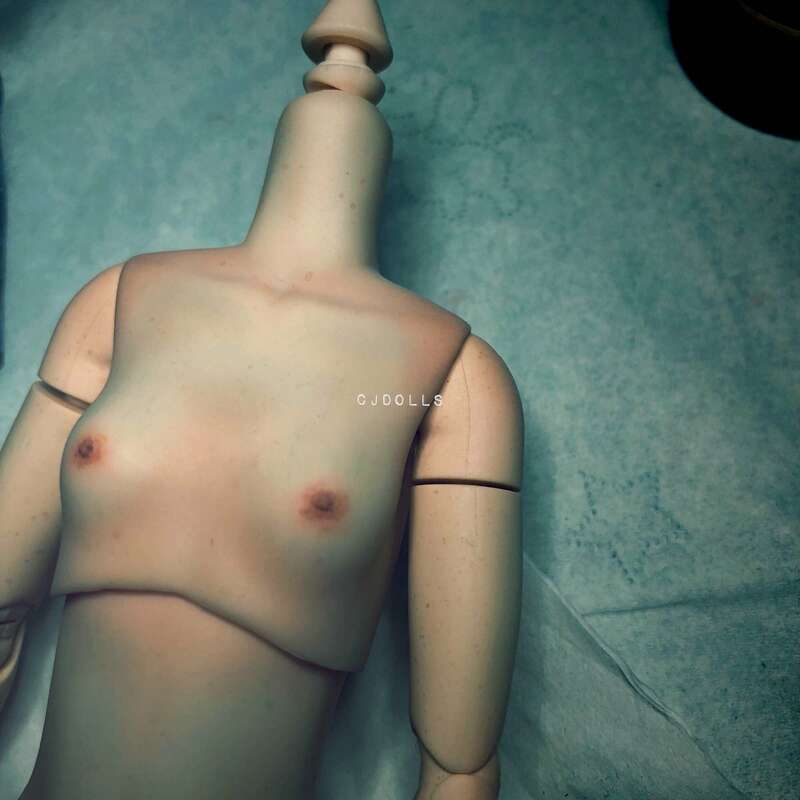 I will go on study for a doctor’s degree in Experimental Art next year. 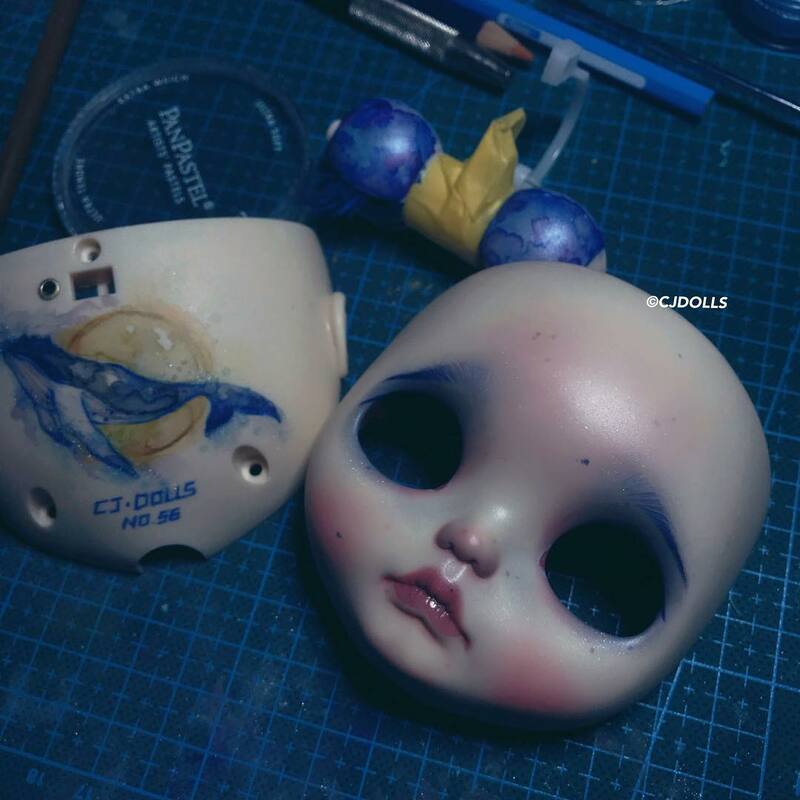 Besides customizing Blythe dolls, I also do painting and design. I’ve always been keen on unique things, everything new and mysterious attracts my attention. Hopefully, I will always keep a heart of exploring life and the world, which is the power origin of my creation. 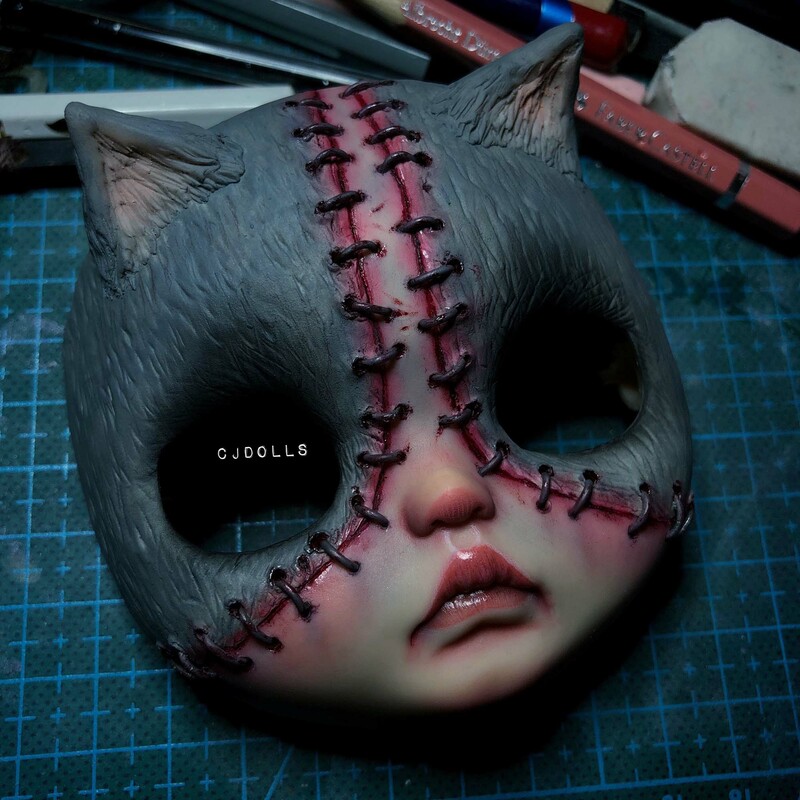 In my junior high school, I got a wallet with a picture of a Blythe doll in the shop opposite the school. 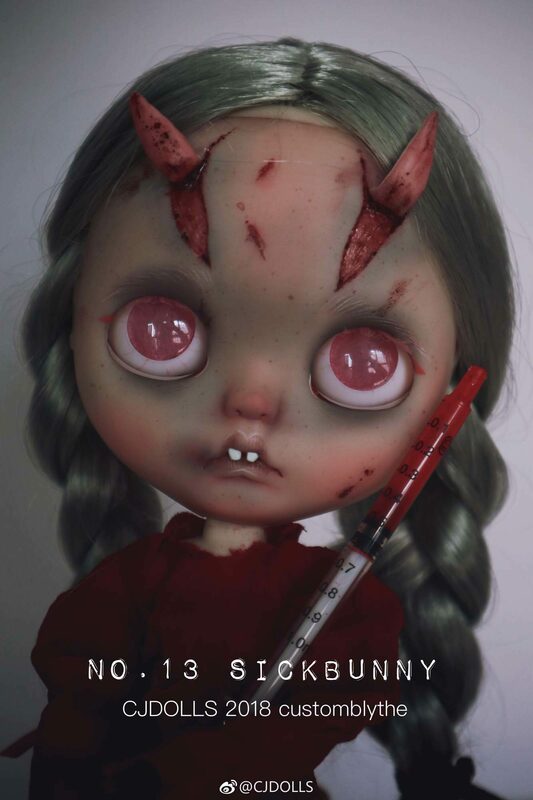 It was my first time seeing a Blythe. I fell in love with the wide-eyed doll at first glance. It was so special. 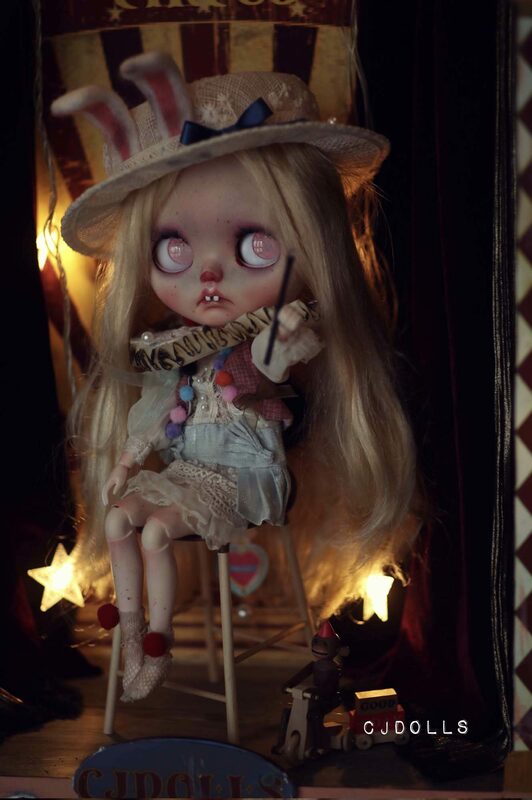 But at that time I did not know the way to buy, so it was my wish to get a Blythe all the time. As Blythe dolls became more widely known, and there are more ways to purchase, I got my first one, a Guava Blythe. Without overthinking about styles, I insisted on doing my favorite details, and everything happened naturally. 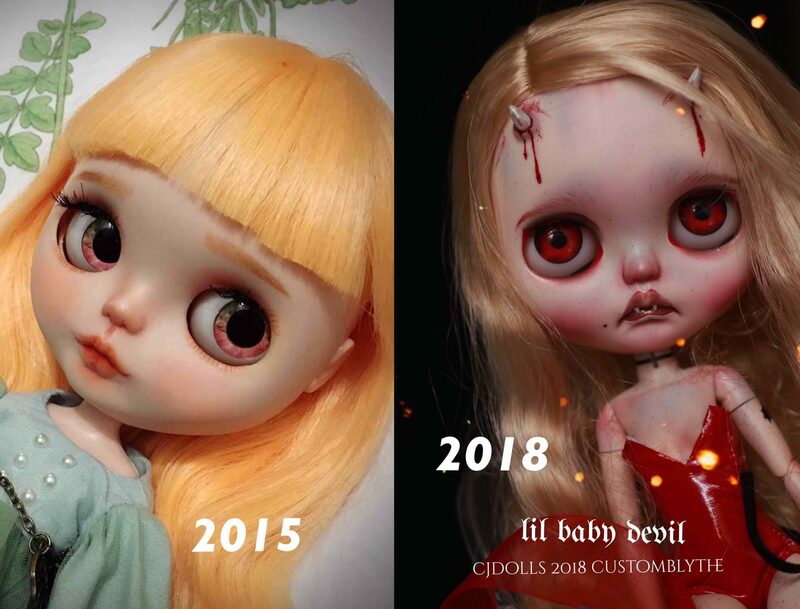 First doll by CJDOLLS (2015) and latest custom (November 2018). 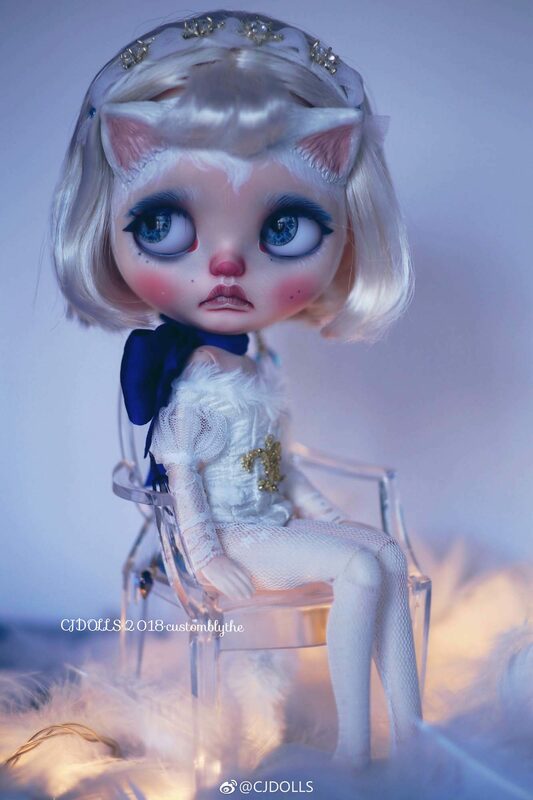 I make Blythe dolls mainly as a hobby, but it is also related to my major in a sense as the humanized doll is also a part of Modern Art. 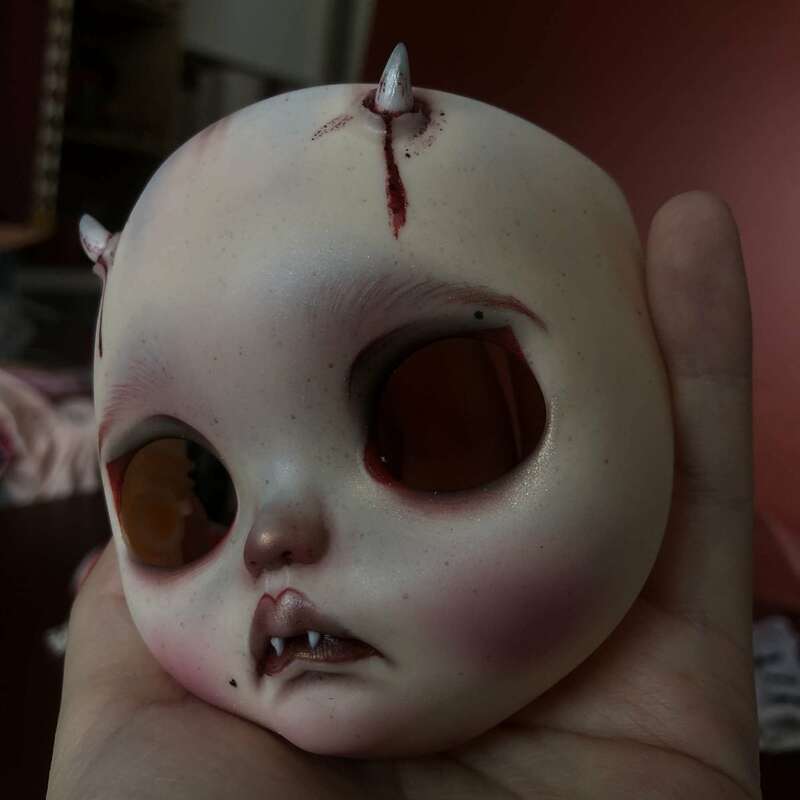 I will also bring a lot of emotions and thoughts into making Blythe doll, just like when I was working in Art. For commissioned work, I will start with a plan: look for inspiration, draw sketches to finish. But sometimes I’ll get some inspiration all of a sudden and then make it. 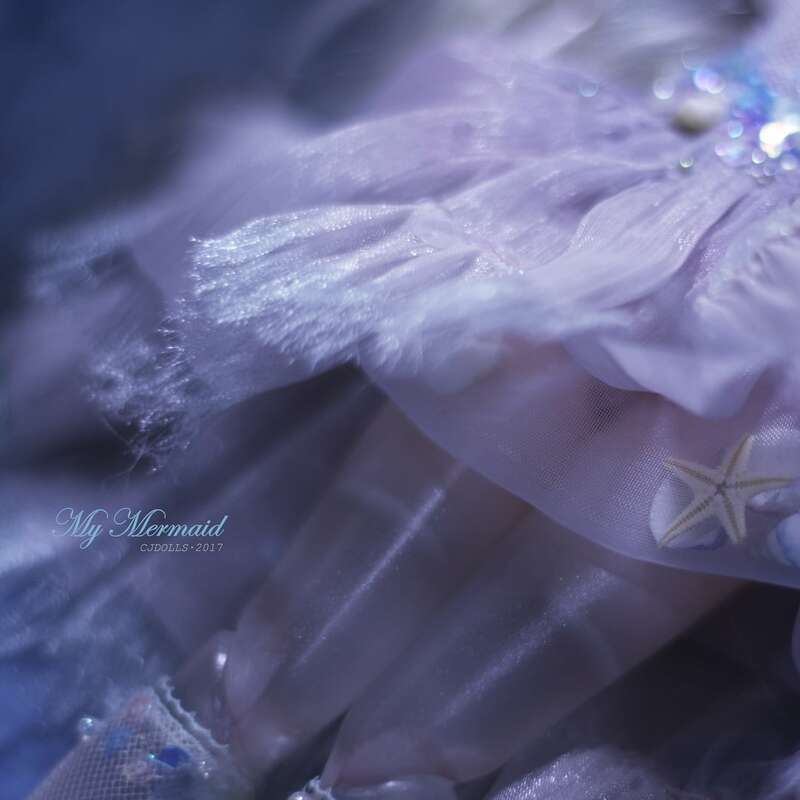 In the ‘My Mermaid’ custom, she used a transparent Azone body that was partially worked to be semi-opaque in some areas. Such an inventive technique resulted in a very original version of the mermaid concept. I guess I don’t have any part that I dislike. However, I can run into some trouble when I conceive the work. 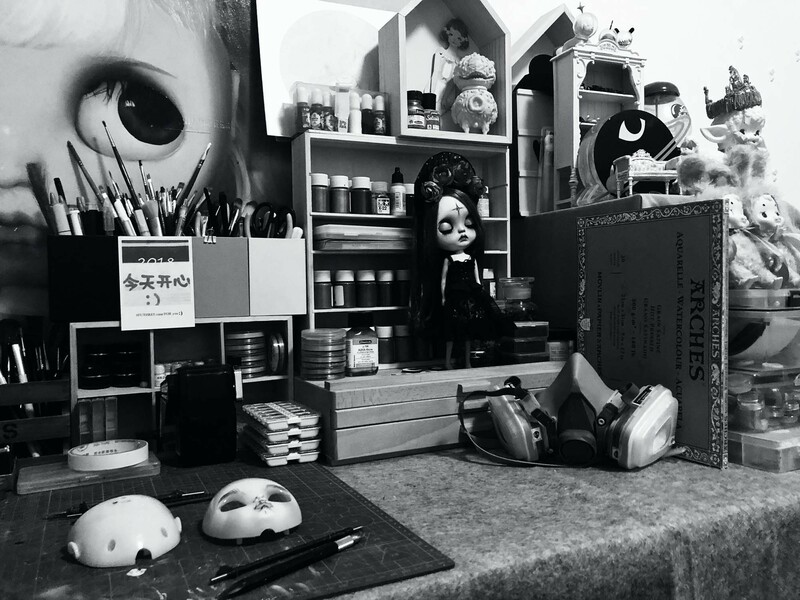 It usually takes one to one and a half months to make a doll. 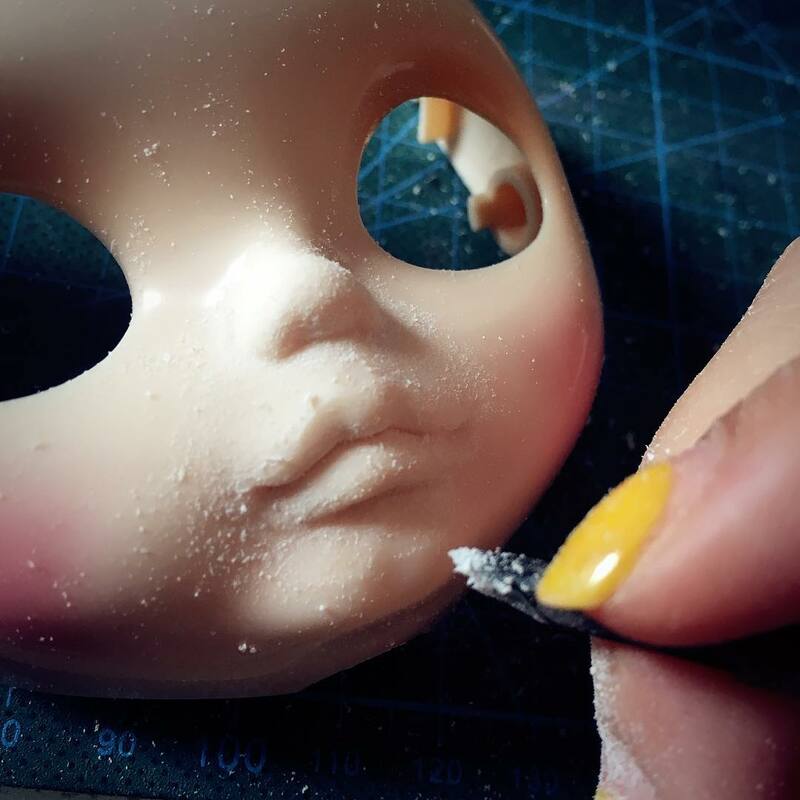 I make Blythe dolls, draw and do all manual work in my studio. My style comes from some of my strange dreamworlds, daydreams or some experiences, poems, movies, and music. If you have to sum it up in a few words, it should be fantasy, strange, melancholy, loneliness. 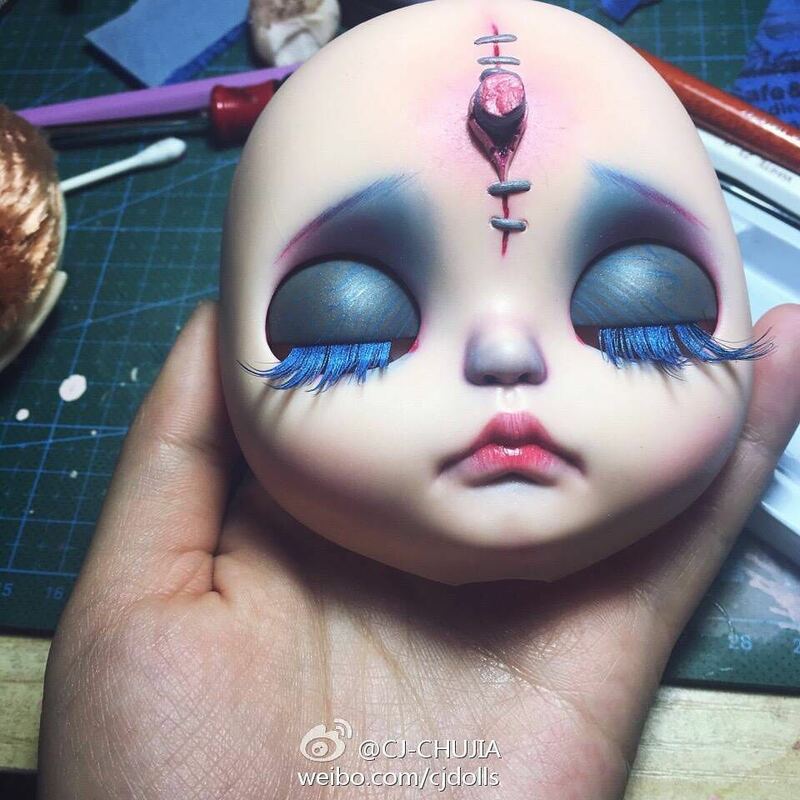 I also hope that different people can get different feelings from my works. I would recommend the pastels of Panpastel. They are very exquisite and highly saturated. As for Blythe molds, I like RBL and RBL+ Blythe and my favorite Blythe model is Cadence Majorette. As for the price, I calculate it based on the complexity of the work and the time it takes. There’s a potter’s price, which is determined by dividing the most modest expenditure of his family by the number of works he produces each year. It is very important to stick to your style and original creation by mastering the fundamental making method. 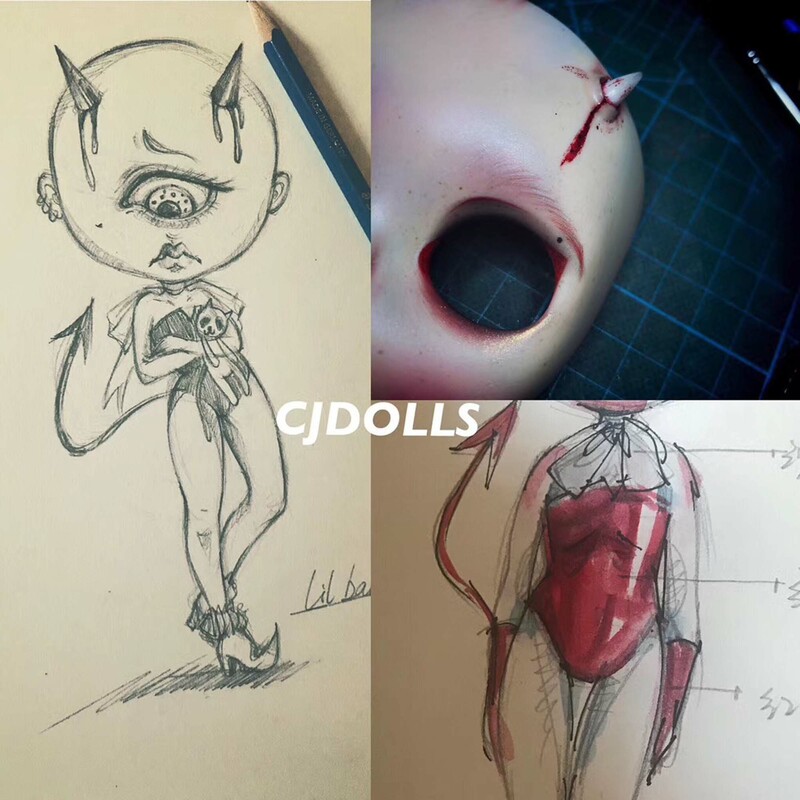 In late 2016, CJDOLLS style emerged. You can see in these samples above. 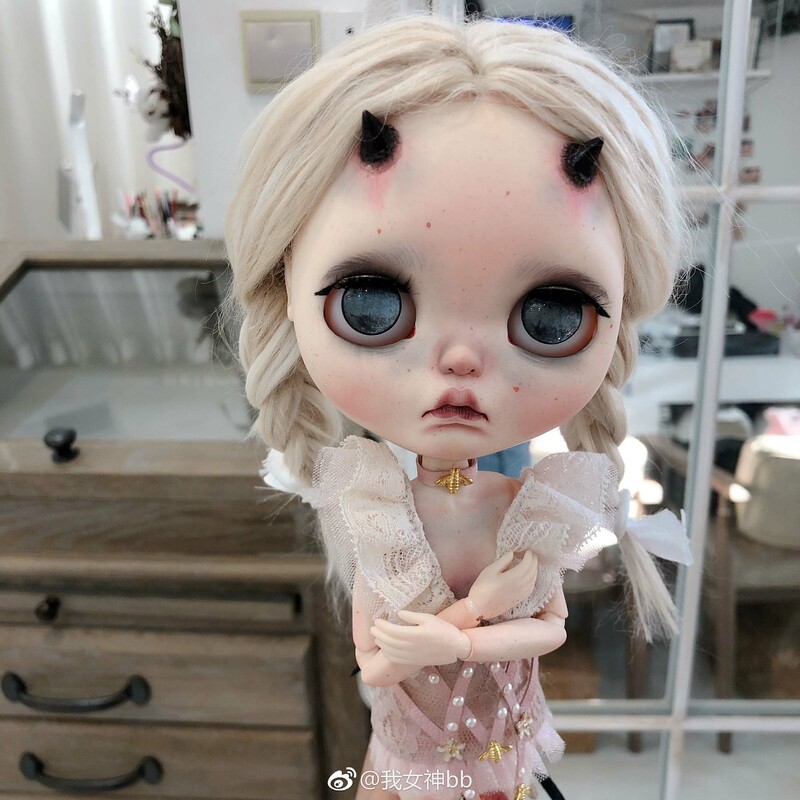 Just one year after starting, Chujia Yin discovers her unique style, her own Blythe language. 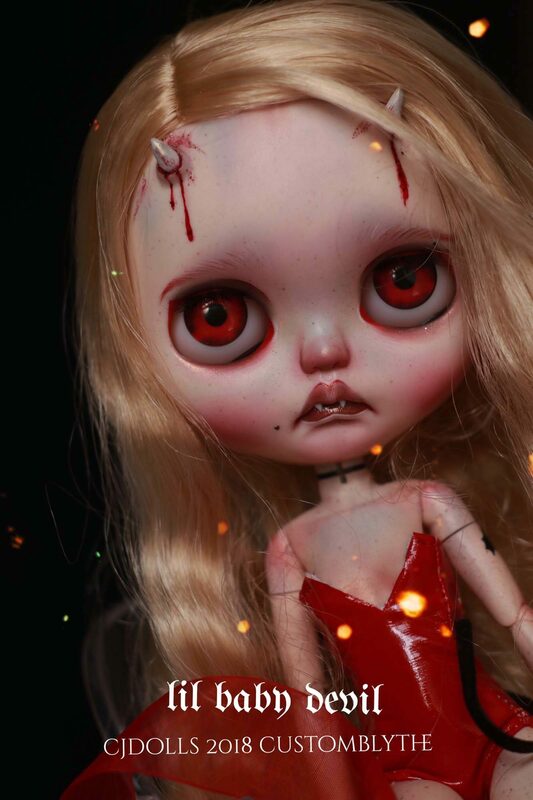 Her sweet dark dolls are a feast to the eyes. 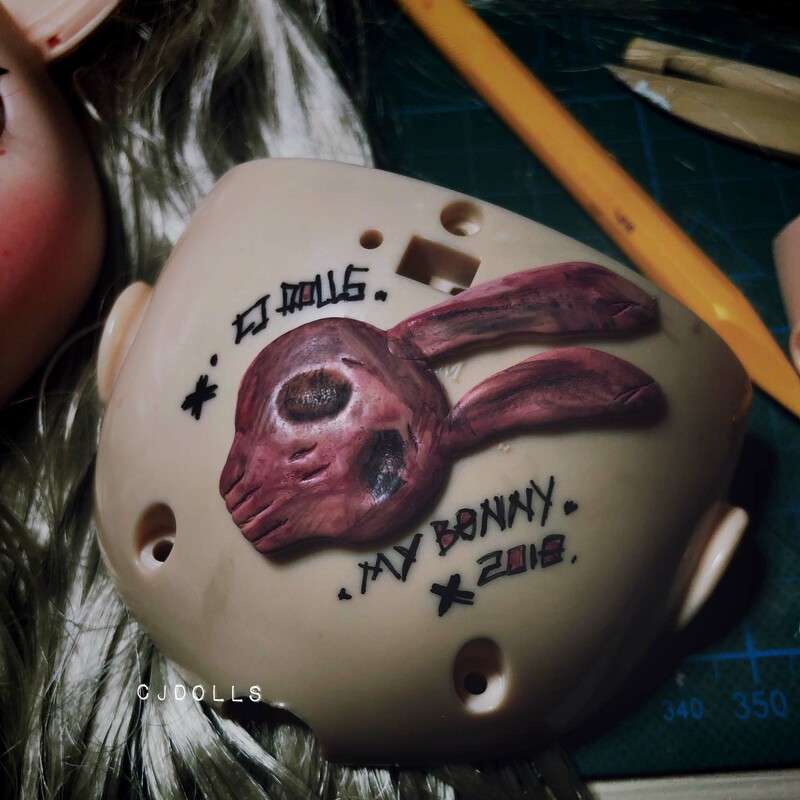 Each doll tells a story, all the details are there: fantastic work on the faceplate and backplate of the doll, hair, eyes, all the scars, wounds, marks, textures that she adds, all the accessories and clothes. 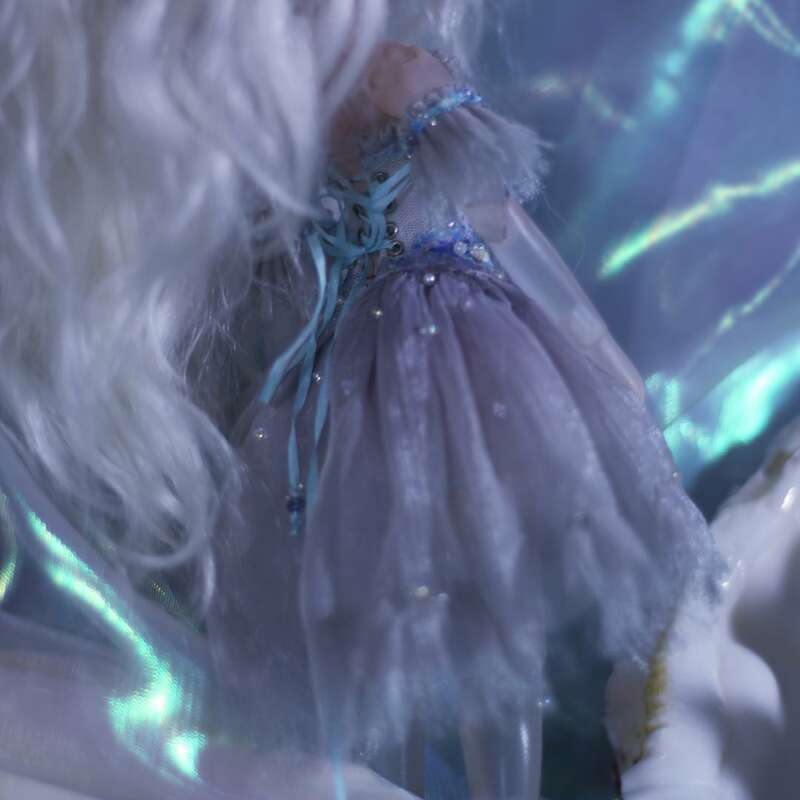 All come together in great harmony to create a doll that goes beyond itself. How to Purchase: Purchases are via MicroBlog / Instagram or Facebook, generally by lottery.